Children with more highly educated mothers remained more likely to be enrolled in preschool across 1995 to 2011. 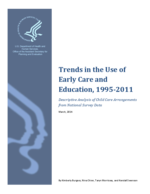 Further, higher maternal education was associated with higher levels of private preschool enrollment and lower levels of public preschool enrollment. With regard to public preschool enrollment, there were no differences in the use of public preschool by levels of maternal education below a bachelor’s degree; however, children whose mothers had a bachelor’s degree were less likely than those with less-educated mothers to participate in publicly-funded preschool. Public preschool enrollment also increased at a similar rate across all levels of maternal education. Children with unmarried mothers were more likely to be in public preschool and less likely to be in private preschool, compared to those with married mothers. Children with native-born mothers were more likely to be enrolled in preschool and more likely to attend private preschool than children with foreign-born mothers.